This two hander by Gary Graves is a riveting history lesson for those fascinated by the perfidy of the Borgias or the genius of Machiavelli. As with all of Mr. Graves works, it is meticulously researched and chock full of interesting fact and trivia. Unfortunately for an evening at the theatre, while never actually dull, it lacks dramatic force and is ultimately more informative than entertaining. This is not the fault of two excellent actors, who bring psychological subtlety and linguistic insight as well as physical and vocal grace to these two characters. Lucas Hatton, as Borgia, is a formidable physical presence, at once threatening and seductive. It is easy to see how he has successfully wooed Louis of France, Leonardo da Vinci and the vox populi. Benjamin Stowe’s Machiavelli is every inch the fox, carefully assessing the lion, playing both diplomatic ends against the middle, dodging and calculating, playing for time, seeking the best advantage for himself. He is, well, deliciously Machiavellian. 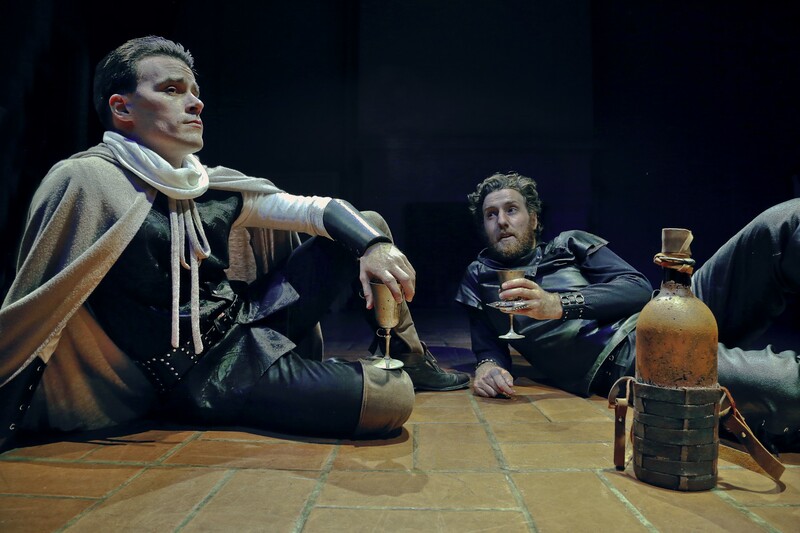 Benjamin Stowe and Lucas Hatton as Niccolo Machiavelli and Cesare Borgia in “The Lion and the Fox”. Photo credit: Jim Norrena. This material is challenging and intellectually engaging, and never boring. To this viewer, it seems more like a performed essay than a play, more prose than drama. But it is finely balanced prose, skillfully presented. For amateur and professional historians alike, or just those who are intellectually curious and at least casually familiar with the history of Renaissance Florence, it will serve as a fine adenture in thought. For seekers of drama and theatrical verve, it may fall flat. Central Works and writer Gary Graves must always be commended for tackling difficult subjects, engaging ideas on a more than superficial level, and educating audiences who are curious about history. It is a company that has been successfully producing plays for 24 seasons, and “The Lion and The Fox” is its 41st world premiere. That is a history that commands respect. “The Lion and the Fox” a Central Works Method Play written by Gary Graves. Director: Jan Zvaifler. Costumes: Tammy Berlin. Sound: Gregory Scharpen. Cesare Borgia: Lucas Hatton. Niccolo Machiavelli: Benjamin Stowe.